Funeral services will be held Oct. 18, 2005 at 10:00 a.m. at the Park Hill Baptist Church with the Reverend John Lee officiating. Interment will follow at the Tahlequah City Cemetery. Services un [sic] the direction of Hart Funeral Home of Tahlequah. Wynona, was born on May 30th, 1918 in Tahlequah, OK to Lindsey and Madlene (Triplett) Wilkerson. Her family later moved to Pawhuska and Wynona graduated from high school there. On March 20, 1940, she married the love of her life Homer Henshaw om [sic] Pawhuska, OK. To this union three sons and one daughter was born. The family has called the Tahlequah area home since 1943. When she wasn't busy tending to her home and family, Wynona attended Home Extension Missionary Union, taught Sunday School at Crescent Valley Baptist Church, and worked for the American Diabetes Association. She was a gifted cook and loved to travel and sew. Trips to the Bluegrass Festival were a particular favorite. A loving wife, mother and great-grandmother, time spent with her family was very special to her. She was a devoted Christian who led by example, she was a member of the Park Hill Baptist Church. A true friend to many, she will be greatly missed by all who knew and loved her. Those preceding her in death include her mother, a son and daughter, Ronald Henshaw and Carol Ann Dotson, one sister Billie Ferguson, and a brother John Evert Triplett. Those left to cherish her memory include her devoted husband of 65 years, Homer, two sons, Donald "Butch" Henshaw of Tahlequah, and Robert and Peggy Henshaw of Tulsa, OK. three sisters and two brothers, Estelle Cooper of Ft Gibson, OK, S Mary Rogers of Hulbert, OK. Sally and Steve Foster of Bristow, OK, Sam Triplett of Tahlequah, and Edward and Jacqueline Triplett of Marble Hill, MO. Five adored grandchildren, Lana and Doug Melton of Oklahoma City, Leslie and Joe Bridges of Tahlequah. Lance Henshaw of Phoenix, AZ., Carrie Jo and Gary Willis of Tahlequah, and Amanda Henshaw of Tulsa. 11 great grandchildren; as well as many nieces and nephews, cousins, and a host of friends and loved ones. Funeral services for Homer Clay Henshaw, age 91, will be held at 2:00 P.M. on Friday, August 15, 2008 at Park Hill Baptist Church. Interment will follow services at Tahlequah City Cemetery. The care of Mr. Henshaw and his family has been entrusted to the compassionate staff of Hart Funeral Home. Homer Clay Henshaw was born on August 28 [sic], 1916, the son of Robert Clay Henshaw and Pearl Walling. On March 20th, 1940, he married Wynona Wilkerson in Newkirk, OK. They moved to Tahlequah in 1943 and have since resided. 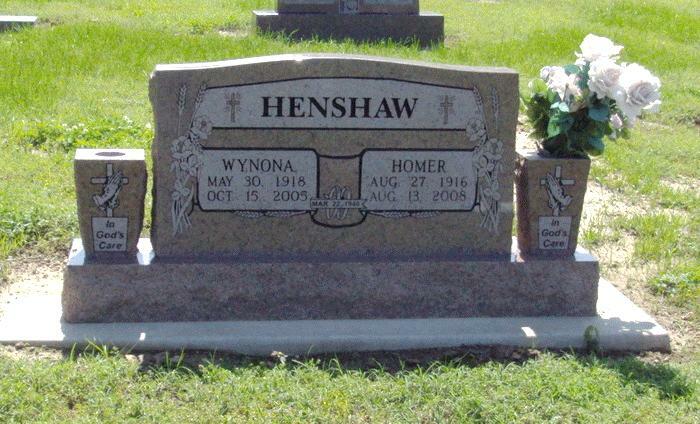 Homer was owner of the Henshaw Construction Company. He was a member of the Crescent Valley Baptist Church prior to moving his membership to the Park Hill Baptist Church where he taught Sunday School. Homer loved to travel with his family and enjoyed attending Blue Grass Festivals. Homer passed away on Wednesday, August 13, 2008, in Tahlequah, OK. He was preceded in death by his parents, by his wife, Wynona Henshaw, in 2005, son, Ronald Henshaw and by one daughter Carol Ann Dotson. Homer is survived by two sons, Donald "Butch" Henshaw of Tahlequah and Robert Henshaw and wife Peggy of Tulsa; one sister Dorothy Coker of Westmoreland, TN; five grandchildren, Lana Melton and husband Doug of OKC, Leslie Bridges and husband Joe of Tahlequah, Lance Henshaw and wife Shawnda of OKC, Carrie Jo Willis and husband Gary of Tahlequah and Amanda Reaves and husband Mark of Tulsa; twelve grandchildren as well as many other family members, friends and loved ones. 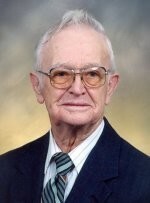 Obituary of Homer Clay Henshaw. Obituary of Wynona (Wilkerson) Henshaw.